All These Classic Mini Consoles With Pre-loaded Games Need To Stop!!! Don’t get me wrong, I like the idea of re-releasing old consoles in a miniature form for all the people who missed them. But most of them are quite pointless since you can get most of these games on every system for the last 2 generations, except for the upcoming Sega Genesis Classic. But even that, there have been so many Genesis collections that it is completely redundant. Why not, instead, do these video game companies just release a dedicated mini console that has nothing preloaded on it at all? Instead just let it have an internet connection to something like the PlayStation Store or Nintendo eShop where games of that console can be purchased for cheap. Instead of being forced to have 20-30 games, why not give gamers a huge selection, ideally eventually getting the whole libraries of these systems on there. Yes, I know that is an unrealistic amount of work, but it’s better than releasing the same classic games over and over again on every new console, scamming people into buying them multiple times. Imagine just buying a cheap NES Classic with no games. You plug it in, hook it up to the internet, search for a game you want, and bam! it is there. Now you have the liberty of searching for every game that ever came out on the system, and you have it forever. If these companies continued to support these mini consoles, then there would be no need to re-release these games every few years on different consoles. It would be great to buy an SNES classic with nothing preloaded onto it, because I have almost every game on the classic. Instead of buying games I already own, I can search for the games I missed and play them on a dedicated SNES platform where I can digitally buy any SNES game ever made. Right now I am at the mercy of what has been ported to Wii and Wii U, or else finding a very old copy on eBay or a very expensive copy. Just think of these companies as physically re-releasing these consoles all over again, and now you have the ability to buy any and all the games you desire, on a system that is capable of running with today’s technology. And if possible, have it able to play all the old cartridges and disks from the original system, which would mean compromising the “mini” part to an extent, but oh well, that’s something we are not really worried about I would venture to say. I absolutely love the Sega Genesis. But unfortunately I have not played nearly any of the games I have for it for some reason, and most of the ones I did play as a child, I no longer own. So this list will be comprised between a mixture of games I own and used to own. Not that that really matters. So here we go, my favorite games for my favorite Sega console! I was a huge fan of wrestling as a kid, so the cover alone of this game got me pumped. As for the game, I hated it first because I couldn’t figure out the controls. After studying the manual and practicing, I finally got it down and the game turned out to be a lot of fun. My brothers and I would play this all the time. I got this because I was a huge fan of King of Dragons for SNES and this looked to be about the same. It’s just as hard, and almost as fun. I was much older when I got this so I didn’t really put a lot of time into it, but I loved the time I did. This is a phenomenal and extremely challenging pinball game, one of the best ever made probably. For being completely out of Sonic’s element, it manages to feel like a Sonic game. I remember being so excited for this when I first heard about Sonic being in 3D! It was like a dream come true. I remember also being immediately disappointed with it, but it was something new and risky, and I respect it for that. It’s quite fun anyway. I was never a big fan of the show, but I did really enjoy this game. You went through different movie sets trying to stop Ottie I think…it’s been like 2 decades since I’ve played it. But the level design was fantastic and there was some great platforming. It’s a very difficult game, but I managed to get further and further every time, though I never did beat it. This game is rather similar to Super Adventure Island, but on crack and I immediately fell in love with it. And it has co-op, so my brothers and I would play this all the time, just having a blast. I don’t think any of us ever beat it, but that didn’t matter, it was all about the journey man. Good stuff. At long last a game emerged that could rival Mario. This fast paced platformer was something new and done to perfection. You always wanted to run fast, but had to show restraint or else you would most likely wind up dying. But the game would give you plenty of all out running moments as well, and with multiple paths to take from beginning to end, it is just one of the greatest games out there. This game takes everything amazing about the first game and just builds upon it, making it far better. Again, this just improves upon the second game, even giving it a deeper story. I still remember how I felt playing this for the first time. I remember being in awe just from the sight of the cover. But that was nothing to when I actually played it. Getting to play as a way cooler character than Sonic was just mind blowing, but to have them play through separate story lines that connected with Sonic 3 was even more mind blowing. The greatest thing was the unusual cartridge that allowed you to plug Sonic 2 and 3 into the top of it to play the full games they were intended to be, and with Knuckles now playable. This game basically gave us everything we ever wanted and I still play this game as often as I can today. And that’s it. My 10 favorite games on the amazing Genesis console. Of these 10, I unfortunately only have 7 still in my possession, and of the 43 Genesis games I currently own I’ve only played a small handful of them, and none of them very extensively. I fully plan to get around to it one day in my lifetime…and you can bet this list will most likely change. How Well Do You Take Care Of Your Games? I am genuinely curious about the care people show to their games, and this is because when I buy used games on sites such as ebay, the amount of ware and tare on these games has generally been fairly varied. A lot of the times I get the games in splendid condition, maybe a scratch or two on the disk, a cracked case, you know, cosmetic stuff that is bound to happen, but also pay a bit extra for them to be in that condition. But then half the stuff I look at and avoid buying unless there is no alternative look like these games have been through a war or two, plus a few trips through the washing machine. Like what in the blazes are people doing with these games? The cover art inside the case is trashed. Why is it even out of the case? The booklets are soggy or missing. What are you doing with them? Do people really take them out and use them so much that they are torn to shreds and/or never return them and become lost. Do people use them for toilet paper? Some game discs are so scratched it appears that they never reenter their case after being taken out the first time. And this I have personally witnessed. Some of my friends will just pop the game out, throw it off to the side and then put another one in. They repeat this process until there are a dozen or more games thrown about the living room, and then they wonder why they can’t find a game or why it doesn’t work. And for old cartridge games, the cover labels are practically dissolved down to nothing. How does this happen? I was being serious when I said they looked like they went through a washing machine. It is the only thing I can think of to make some of these games like this. Here is a game I bought about a year ago on ebay. What happened to it? How did it get so messed up? I had to buy this for there was no other choice, and I was honestly, extremely surprised that the game even worked. And this is in fairly good shape compared to some that I have seen! Like, I just have to know what people are doing with these games. I personally take wonderful care of my games. 99% of them I could wrap in plastic and sell them as brand new. And that other 1% could come pretty close as well. The only signs of use are the old cartridge SNES games mainly, because as they age they become discolored from the original gray. And this isn’t even a sign of use, so much as just a sign of being old. I keep everything in a case at all times, and keep them neat and organized so nothing happens to them. So I would just like to hear how you treat your games. Are they in good shape? If not, how did they became like some of the monstrosities I have seen? I have been hearing a lot lately about how people would very much like to see some “Super Smash Bros For Switch Deluxe” something or other, this title being an updated version of Smash for Wii U and 3DS combined, but with some bonus material as well, much in the same manner they did with Mario Kart 8 Deluxe and Pokken Tournament DX. Well, I’ve got a better idea. How about a brand new Smash game? Doesn’t that sound better? Sure the other one would likely come out a whole lot quicker, but why spend the resources? A brand new game, fitted just for Switch makes a whole lot more sense to me. And this time, without the limitations of the 3DS holding it back, it could be a truly perfect game, as good as it can be for both home and handheld play. That is what I want. Not a remake. But while we are on the subject, let’s talk a bit about the series and what I hate about it. Well…hate might be a strong word. Let’s get this straight. I love the series…all 5 games are incredible and I still play all of them regularly. The matches are the best part about this. Local multiplayer and even yourself fighting against 3 computers for the sheer fun of it is truly something incredible. I love the varying stages and the creative and different ways to play on each one. I love the huge cast of characters, and yes, I am including clones as well. I realize they are just a generous bonus from the developers and not “taking the place of another character” as so many outraged people claim. It’s nice to see a clone character rather than them being just a costume. Anyway, playing four player with random characters on random stages has brought me thousands of hours of enjoyment. But then we get to the more single player stuff. I can not stand it anymore. The multi-man challenges, the homerun contest, the target challenges, classic mode, adventure mode, all-star mode. Dear God I am so sick of them all! I can’t sit there and beat all these modes with every character in the game another time. We’ve already done it 5 times, and with an ever growing list of characters, it becomes more tedious and annoying. If they are insistent on leaving these, then at least allow us to use a large group of characters at once, or stop giving out trophies for beating it with each one. If you give no reward that people want, then only those who want to do it for fun can have at it. The rest of us who want to collect everything shouldn’t have to suffer through such repetitive and tedious things. So here are my wishes for the next Smash installment. Drop all that crap. We don’t need it. Developers should spend all their time on characters and stages. Obviously, most of their time is already spent on this I would imagine, but without everything else, they can give us some more. Include every stage and character that has already been in each game and then add a bunch more. I know that is a lot of content and very unrealistic, but who cares? This is my dream! This is all I care about, as many characters and stages to use them on as possible. Oh and maybe some more unique costumes instead of just recolors would be nice too, like what Project M did. Though they do generally base the recolors off a other costumes, so that is something at least. But if they really need to keep some single player stuff, keep the event matches. They are actually really fun to play, so I wouldn’t mind that. Oh, and what happened to unlocking stages and characters? In the Wii U version, you started with nearly everything. Unlocking characters in Brawl and especially Melee made everything so satisfying and fun, and you felt so accomplished after getting them all. And yes, I know if they take out all the fluffy crap like Classic Mode, how will you ever unlock characters? And I simply say, they will think of something, whether it be the event matches, or doing something specific in battles with specific characters or what not. It could easily be done. Make the adventure unlocking characters, not collecting hundreds of trophies from repeating the same tasks over and over again. Keep trophies for sure, but good God, we don’t need classic anymore. Or custom moves…those have to go. That was the worst. They forced us to beat modes with the same characters over and over again, praying that we would get all their move sets, only doing so after getting the same ones 50 times before getting that damned last one. That was the most tedious chore of them all. And this game shouldn’t be a chore. It should just be what makes the game so fun. All out fighting and trying to win for no other purpose than to have fun. 5 stock matches with no time limit for me, all day, everyday! 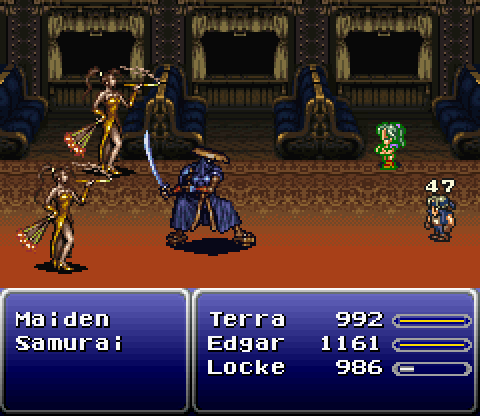 At long last, my Final Fantasy marathon ends here…for the time being anyway. And I have to say, it ended with a great game, bringing me back to my early days when I first played FF 8 and 7, as I described in my post about the first game. After playing through this game, I have come to the conclusion that Final Fantasy didn’t truly become great games until the PlayStation. I really enjoyed 7-9. The more advanced system with it’s “powerful” hardware allowed for some great story telling visually with the beautiful cut scenes and also the bigger space spread out on multiple discs allowed for more in game story told through a much larger world as well. 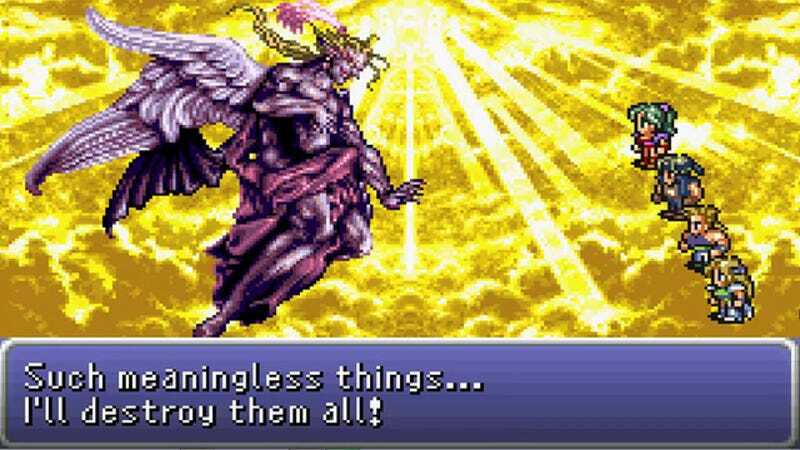 FF9 was also void of any annoying things that plagued the series from 6 downward. There were only 2 cheap instant death encounters I met the whole game, and it was mainly due to cheap overpowered counter attacks. For once, I could go through the whole game without wanting to pull my hair out. Gone too are the obnoxious amounts of random encounters. Most games had you fighting endless amounts of battles for little experience. FF9 reversed that by having less battles with more experience, and that is just fine by me! The skill system is great in this game as well. Each equipable item has skills attached to them that can teach one specific character something, or multiple people. This is truly great, for by the end of the game, all your characters know a vast amount of skills that you can equip to fit your needs at any time. The story isn’t great, but it’s enjoyable enough, and there is great character development. The ending, however, is very weak and unnecessarily long for such a disappointing payoff. But the character development sort of makes up for that though. The only real complaints I have about the game is that the encounters take way too long to start…like over 10 seconds you have to wait before the battle begins. First it kind of loads, then you are forced to watch as the camera unnecessarily scrolls through your environment, as if the developers were so proud of the world they created. Then your party and the enemies magically fade in to existence and then finally the fight begins…which brings me to my second complaint. The fighting seems so delayed. It is so slow moving. Sometimes you just are sitting there waiting for something to happen. Even when you have given each member something to do, everyone just kind of dances around for a while, then the enemies go, then one of your characters attack, then the enemy might go again after waiting, then wait some more for one of your guys to go. Honestly, if you tell all four of your characters to do something, it might take close to 2 minutes for your fourth character to finally go. By the time they do, the other 3 have already refilled the battle meter thing and have new commands already inputted. When that fourth character finally goes, you had forgotten what you told them to do and a lot of the time, the flow of the battle has shifted by then so that their attack or whatever is more or less useless. But other than that, it is a fun game that I really enjoyed. Now I can finally understand why these games have some kind of following. It only took 9 games and 15 years. As always, I will rank the games from best to worst. This time though, I will include 7 & 8, though it is a little unfair since I never beat them completely.